Beautiful certificate from the Lawrence Manufacturing Company issued in 1871. This historic document has an ornate border beside it with the company name centered on top. This item has the signatures of the Company’s President, and Treasurer, and is over 138 years old. Issued to the President and Fellows of Harvard College, and signed by Treasurer of Harvard College, Nathaniel Silsbee , on the back. Nathaniel Silsbee, Jr. was born in Salem, Massachusetts on December 28, 1804. He served as Salem’s Mayor from 1849 to 1850 and then again from 1858 to 1859. He was also the Treasurer of Harvard College, his alma mater, class of 1824. 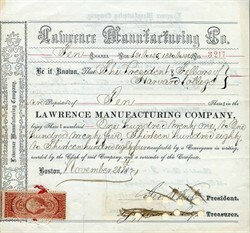 The Lawrence Manufacturing Company, in Lowell, Massachusetts, was incorporated in 1831 and began operations in 1833. The company initially manufactured shirtings, sheetings and printing cloth, but added themanufacture of knitted goods such as hosiery and underwear in 1864. The founding of the company followed the pattern of other mills that hadbeen established in Lowell over the previous decade. Boston businessmen Nathan Appleton and Patrick Tracy Jackson recognized that Pawtucket Fallson the Merrimack River, located in the sparsely settled area of EastChelmsford, represented a prime source of water power that could beharnessed for profit. In 1821 Appleton and Jackson, with a group ofinvestors, incorporated as the Proprietors of Locks and Canals on MerrimackRiver. They bought the land and water rights to the area. Those investingin a mill would buy the land outright and then lease the water power fromthe Proprietors of Locks and Canals. Frequently, of course, the investorsin a mill and the Proprietors of Locks and Canals were one and the same.East Chelmsford was incorporated as the town of Lowell in 1826. By 1831 there were seven mills operating in Lowell. Believing that therecontinued to be room for growth in the textile industry, the same group ofbusinessmen looked to open yet another mill. As before, they were willingto put up most of the capital for a new cotton mill if competent men couldbe found to run the business. Brothers and business partners Amos andAbbott Lawrence, successful Boston merchants who had also invested in theSuffolk and Tremont Mills, were approached. They accepted the offer not least because their firm of A. & A. Lawrence would thereby becomepermanent selling agents for a group of mills, thus greatly expanding theirdomestic cotton business. The organization and operating policies of LawrenceManufacturing were representative of other mills in Lowell. A seven-manboard of directors controlled the company from a Boston office, settingpolicies and making decisions. The treasurer, who was a member of theboard, made purchases, paid bills, and managed the day-to-day business ofthe corporation. Subordinate to the treasurer was the mill agent, based inLowell and living in a company-owned house, who was in complete charge ofboth the mills and the boarding houses. After 1844 the mill agent also handled payroll and routine factory expenses. Lawrence Manufacturing maintained its own warehouses forcotton in New Orleans, Boston and Lowell until 1850. At that time the NewOrleans warehouse was sold and cotton was shipped directly to Boston assoon as it was purchased. Determined to avoid the notoriously harsh conditions foundin English textile cities, the founders of the Lowell mills established asystem designed to attract a "respectable" labor force composed primarilyof young women from rural New England. The Lawrence mills resembled theother mills of Lowell in having an overwhelmingly female work force. In1840, for example, Lawrence employed 1290 women and only 200 men. Most ofLawrence's single female operatives, like other Lowell "millgirls", lived in company-owned boardinghouses and on- or off-duty werebound by regulations designed to keep them on the moral straight and narrow. Single men also lived in boardinghouses while married men with families lived in company-owned tenements. Beginning in the 1840's and1850's the number of immigrants employed by Lowell mills increased greatly.At first the immigrants were mainly Irish. Later, large numbers of French Canadian, Polish, Portuguese and Greek immigrants, both men and women, cameto Lowell seeking work. In addition, entire families of Yankees came toLowell in growing numbers. Unlike the single women who had come from ruralareas to work in the mills for a year or two before returning home, thefamily groups, immigrant or Yankee, made Lowell their new home. Notsurprisingly, they tended to live as family or ethnic units and were notinclined to live in tightly regulated company housing. Over the course ofthe nineteenth century unmarried operatives temporarily living and workingin Lowell became an ever-smaller proportion of the labor force. More andmore of the mill workers were members of families who had settledpermanently in Lowell. The boarding houses were used less and less andwere finally sold by the corporations around the turn of the twentiethcentury. Lawrence Manufacturing was affected by economic fluctuations, closing wholly or in part at least three times before theCivil War. In 1862 nine mills in Lowell, including Lawrence, anticipated a shortage of cotton from the south for the duration of the Civil War andshut down entirely. Ten thousand mill workers, approximately 1600 of whomworked for Lawrence, were thrown out of work. Lawrence Manufacturingre opened early in 1864, adding hosiery and underwear manufacture to theproduction of cotton. By 1865 both Amos and Abbott Lawrence had died, and thefirms of George C. Richardson and Company and R.M. Bailey and Company were the selling agents for Lawrence Manufacturing. Townsend and Yale (later E.M. Townsend and Company) replaced R.M. Bailey and Company in 1866 as theselling agents for shirts, drawers and woolen hosiery. Like the other Lowell textile firms, Lawrence Manufacturingwas adversely affected by a number of factors in the decades following theCivil War. Despite expanded production due to the introduction of steampower (inaugurated at Lawrence in 1871), Lowell was no longer preeminent among cotton manufacturing cities. Increased labor trouble, the rise of New Bedford and Fall River as textile manufacturing centers, and economic shifts all contributed to the slow decline of the Lowell textile industry. In 1896 Lawrence responded to changing conditions by abandoning themanufacture of woven cotton cloth, their original product, to concentrateon the previously supplemental line of knitted hosiery and underwear. Despite a brief upswing during World War I, increasingcompetition from Southern textile concerns took a continuing toll onNorthern mills, including Lawrence Manufacturing. In 1926 the assets ofthe company were sold to Stevens and Son of North Andover, Massachusetts.The mills continued to operate as a subsidiary of a larger concern into the1980's.